Modern marketers are often in flux about which is more effective in communicating with their customers and prospects: email or social media. But both email and social media marketers often forget that email and social are fundamentally different channels with very different strengths and weaknesses. While email is the most powerful channel for retention and driving transactions, social is great for instant, community-driven communications. If people show interest in your brand on social channels, chances are they might be interested in your emails as well. Think about ways you can engage your active follower base, educate them about your emails, and make it as easy as possible for them to sign up. Do your fans and followers even know that you have a newsletter? They might not. Reminding your followers and fans about your newsletter and providing a link to a signup page is the first and simplest step for turning fans on social media into email subscribers. While this is quick and easy to implement, it takes the user away from the social channel, potentially interrupting the browsing experience. This doesn’t have to be the case. With Facebook’s customizable tabs and Twitter’s lead generation cards, your followers can subscribe to your newsletter without leaving the social channel. Facebook’s brand pages offer customizable tabs, and you can use those to win new email subscribers. With an opt-in tab, Facebook fans can sign up for your newsletter without having to visit a landing page or your website—it all happens right within Facebook. Many email service providers (ESPs) offer their own Facebook apps, that you can customize and integrate into your brand’s Facebook page to collect newsletter signups. If your ESP does not offer an app, you can manually create a signup tab on Facebook. To do so, add a static HTML iframe tab to your fan page and copy and paste the code of your signup form. 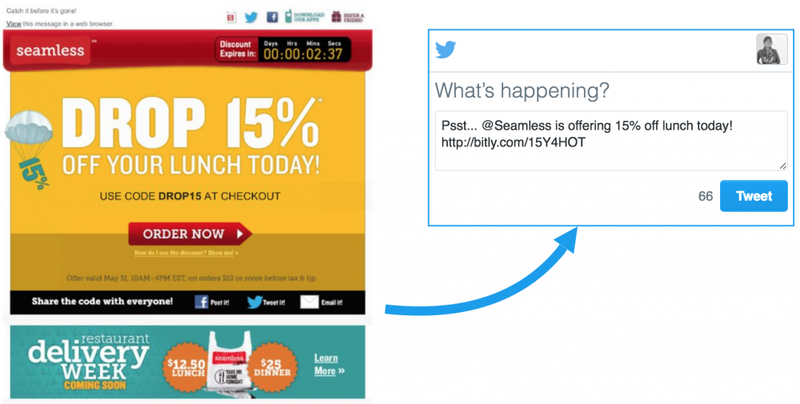 Twitter also allows you to collect email addresses directly within Twitter with its lead generation cards, which are part of Twitter’s ads toolkit. They consist of a customizable image, a description, and a call-to-action. 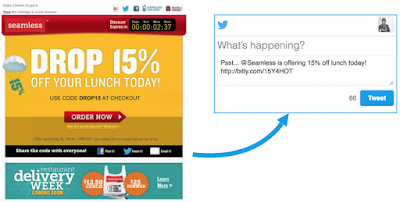 You can attach lead generation cards to a tweet and share it with your followers—in this case, it’s free— or promote it to any other audience on Twitter via sponsored tweets. Twitter users who’d like to join your mailing list can do so with a single click of a button—without leaving Twitter or having to fill out a cumbersome form. Name, @handle, and email address are prefilled in the lead generation card, using information from the user’s Twitter profile. 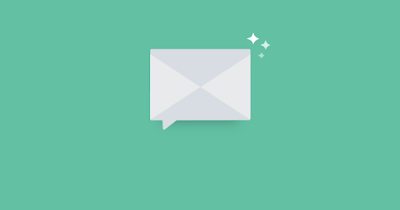 Including icons and links to your social profiles in your emails is the easiest way to make your subscribers aware of your additional channels. In most cases, marketers place social icons on the very top or the very bottom of an email. Including social icons in your email is simple and easy to implement—and that’s probably the main reason why 76% of all email marketers are using this technique already. But while it’s easy, it doesn’t provide the reader with any additional information or actionable advice. What can you expect from the social channels? 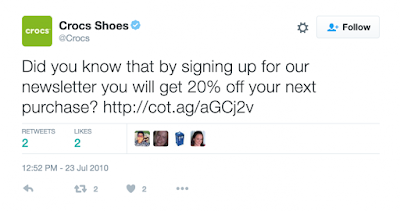 What benefits do the social channels offer that your email doesn’t? Why should the subscriber click those links? Icons alone aren’t giving answers to any of those questions. Always keep the goal of your campaign in mind and ask yourself whether including social media icons helps you reach this goal or whether they only take away from the main CTA of your campaign. If you opt to include them, make it clear why your subscribers should follow you, or share your newsletter on social. The entire email is built around social channels to generate excitement for the launch of the new season of the show. Netflix makes it very clear to the reader what they can expect from each channel: You can connect with the actors on Twitter, get a sneak-peek behind-the-scenes on Instagram, or connect with fellow fans on Tumblr. The “What’s in it for me?” is very clear. You can also use email to promote social contests. This approach makes it very clear to your subscriber why they should move from email to another channel—they have a chance to win something. And, as we know, the idea of getting something for free is a great motivator for taking action. Share-with-your-network (SWYN) links allow your subscribers to share content from right within your email. No matter whether you’d like your subscribers to share your entire newsletter or specific information only, SWYN links move the subscriber right into the social channel’s interface so they can share the content with a single click. Social media can also play a role in your re-engagement campaigns. 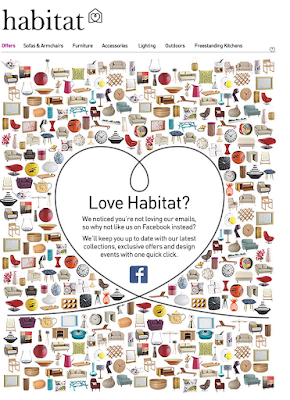 For example, Habitat, a furniture brand, offers Facebook as an alternative channel to subscribers who aren’t engaging with their emails anymore. 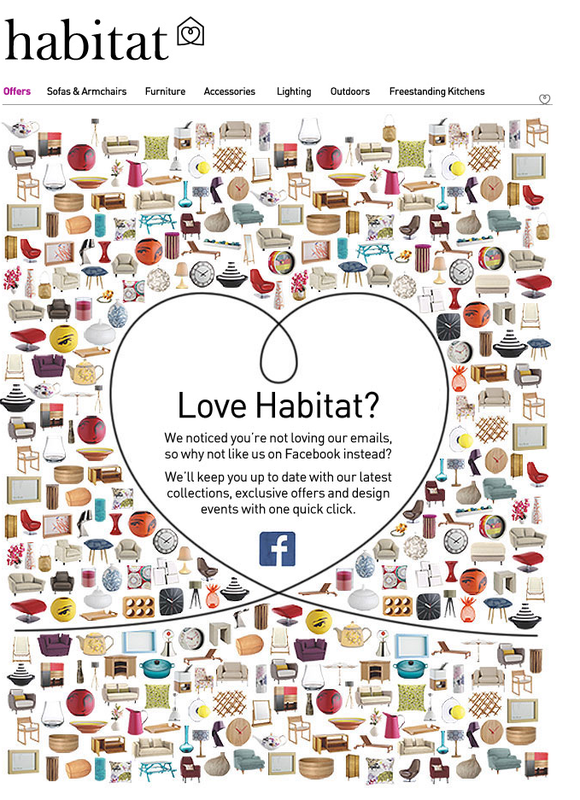 Habitat embraces a fact that many email marketers don’t like to accept: Email might not be the perfect channel for everybody. However, instead of just letting an unengaged subscriber go—and losing the connection altogether—they offer Facebook as an alternative to stay in touch. 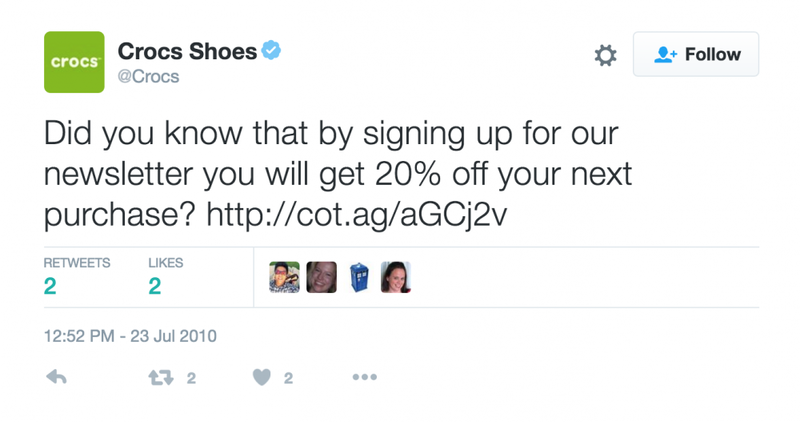 Marketers should also consider adding calls-to-action to join them on social to their opt-out confirmation pages as a way of keeping communication lines open with a former email subscriber. So far, we’ve only used social to promote email signups or the other way around. But in any case, we’ve only motivated people from one channel to use the other one as well. These techniques can be powerful and are a first step toward breaking the siloed approach we see in too many marketing departments. However, true cross-channel campaigns require going a step further. 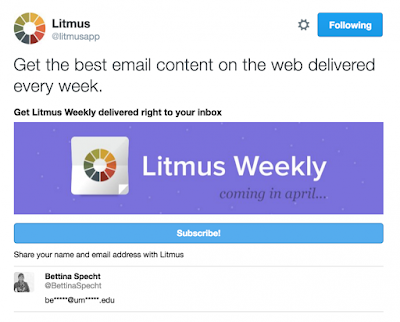 Let’s look at two examples of emails we sent here at Litmus. Dynamic content in email isn’t a new approach. However, by integrating social media content into your email, you can give your followers and fans a voice, all while creating a more personal and more exciting subscriber experience. We used this approach in 2015 when we integrated a live Twitter stream into our announcement email for the Email Design Conference (now known as Litmus Live). In the email, we asked subscribers to head over to Twitter and share tweets containing the conference hashtag. These tweets would then appear in the Twitter feed directly within the email. How did we do that? Using the 15 most recent tweets that included the #TEDC15 hashtag, we displayed the first five tweets by default, then animated the remaining tweets one-by-one over a span of a minute. This allowed us to make the tweet stream feel real time and had the added benefit of keeping people engaged for longer. And it worked. Within the first 24 hours, we had counted more than 750 tweets containing the hashtag. Also, the email saw the longest durations of engagement we’ve seen from any email we’ve ever sent—almost 60% of users viewed the email for over 18 seconds. But it’s impact went far beyond subscriber engagement and Twitter activity: Additionally, the email helped drive over 4,000 new visitors to our website and generated over 1,000 new prospects in that same amount of time. It’s a true testament to the power of social and email when used together in a cross-channel campaign. Email and social media also are powerful companions when it comes to playing games. We sent an announcement email about our conference, but instead of revealing the surprise right away, we had our subscribers and followers guess the third city. And only when we received 500 tweets, email forwards, or Community posts, we would reveal the surprise city. A share tracker within the email showed the progress of the game. As soon as we reached the goal, we revealed the city (it’s San Francisco!) within the email. 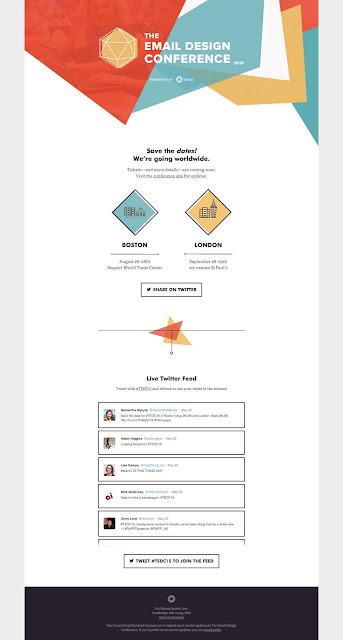 In both examples, we used email as a trigger to promote activity on social, but then had people come back to the email—either to see their tweet pop up in the live twitter stream or to view the progress of the surprise city reveal. In both campaigns, social and email are so closely interlinked that one would not work without the other. It’s not a one-way street anymore. In the end, both email and social media allow brands to connect with their audiences in a powerful way. At first sight, that might make them look like competitors, but in reality it’s what makes them work together so well. 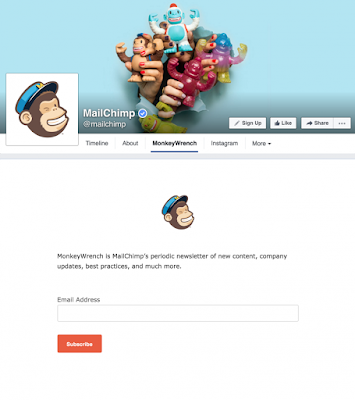 By combining email and social you can use the strengths of each channel. When done right, this not only grows your subscriber list and your fan base on social, but helps to strengthen your brand overall.